We believe, that as well as our pupils receiving top quality tuition they should learn to drive in a top quality vehicle, in maximum comfort. We use top of the range Dual Controlled vehicles with Air Conditioning & Power Steering. The first part is multiple-choice. There are 50 questions of which you have to answer 43 correctly to pass. The second part is the Hazard Perception element. There are 14 video hazard clips, of which one clip shows two hazards. You must score 44 points out of 75 to pass. You must achieve both parts to pass the Theory test. Once successful, you then have a period of two years to pass you practical driving test. Failure to pass the practical driving test within the two years will result in having to undertake the whole theory test process again. Free Theory & Hazard Perception test tuition is incorporated into your driving lessons if required. The first part is two vehicle safety check questions (Show me/Tell me). Incorrect answers will result in a driving fault being recorded on your test sheet; the second part is your driving ability. You are allowed up to 15 minor driving faults before failing your test. 1 major fault and you've failed!! In addition - before starting any of the above tests, your eyesight will be checked by the Driving Examiner. You must read a vehicle registration plate at a distance of 20.5m (67ft) where all letters and numbers are 79.4mm high (three & one eighth of an inch). The new style number plate is to be read at 20m (66ft). Free Show me/Tell me tuition is incorporated into your driving lesson if needed. 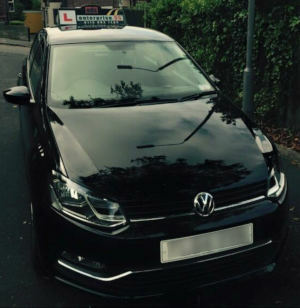 We offer all learner drivers a free mock test so as to familiarise you with test conditions. We offer dual carriageway lessons to all our learner drivers to provide you with the opportunity to experience the national speed limit, whenever possible.